An orangutan celebrated his 20th birthday Saturday at the El Paso Zoo -- Hispanic style. Henry the Sumatran broke a grape-shaped piñata and ate the fruit inside before dozens of visitors Saturday afternoon at the Asian section of the zoo. Rick LoBello, the zoo's education curator, said it was a special occasion for an exceptional creature. "It is a very critically endangered animal," he said. "These animals are extremely intelligent." This kind of orangutan is native to Sumatra, an island in the southwestern Asian country of Indonesia. Although he is mainly solitary, Henry amused children who visited his exhibit Saturday. He covered his fleshy cheek pads with the colorful tissue paper and hid inside the box where his gifts has been wrapped. "He is moving more than usual," said Jaime Coronado, who visited the zoo with his two daughters and son on Saturday. Henry is 4 feet, 7 inches tall and weighs 213 pounds. His shaggy reddish hair is so long that it looks as if he wears a cape. His arms are also long and are used to play with ropes. His mate, Ibu, also at the zoo display, is significantly smaller and less hairy. She is eight months younger. Henry was born on Jan. 1, 1991, at the Albuquerque Zoo. He has been at the El Paso Zoo since November 1997, when the city created the Asian section. "I like him because he looks like my dad," said Sebastian Coronado, 8.
movements Henry made and how much they resembled those of a human. "He looks like a human," she said. "It looks like he is wearing an orangutan costume." Alvarado screamed "Henry, Henry" to catch the animal's attention. Alvarado said she liked going to the zoo to learn how to protect endangered species like the Sumatran orangutan. 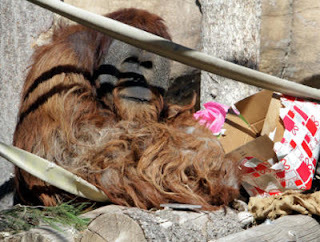 Zoo staff handed out a list of palm oil products to teach visitors what kinds of materials destroy the ape's habitat. "We shouldn't use palm oil to protect these animals,"Alvarado said.